Alice Walker | Me fail? I fly! The Chicken Chronicles consists of 37 short chapters, originally blog posts, about keeping chickens. Not just keeping them, but spending time observing them, enjoying them, being sat on and pecked and fed by them, communing with them, falling in love with them as individuals and as a species, and following the mind wherever they take it. One of Alice Walker’s childhood chores was to wring the neck of a chicken each week for the Sunday dinner. Chickens, or more specifically roosters, featured in her 1992 novel Possessing the Secret of Joy – as a nightmarish presence to do with the genital mutilation of little girls. It’s tempting to read The Chicken Chronicles as Walker’s joy-filled atonement for those sins and slanders of the past. Mommy’s mind is dizzy and her heart sore from all the troubles in the human realm. She sees pictures of other birds, no less wondrous than you, covered with oil and dying of suffocation and despair. How can they fathom what is happening to them? How can they understand they are not to blame? What have they done but be themselves, flying about eating insects and grubs, while appearing marvellous to the human spirit, even whole doing so? She learns soldiers from her country have shot and killed two pregnant women in Afghanistan, one of them Mommy of ten. What is an Afghanistan? You will wonder. Is it edible? Mommy has never been there but she used to wear beautiful long dresses made of velvet and embroidered in many colours, which came from Afghanistan. There’s something real happening here: in addressing the chickens, the mind can go to some basic questions. But any grumpy and humourless children of the Enlightenment should probably stay away from this book. I’m grumpy but not completely humourless, and had to work hard to appreciate passages like that one, and I found a lot to enjoy elsewhere. For, spending time with you, not only did Mommy recall and visualise her own mother’s thumb with its deep, beloved scar, and from the thumb begin to see her mother’s face and actions, but she also began to see, in stark detail, the house near Ward’s chapel: the final and most wretched of all the grey shacks; the house that her mother attempted to hide, as she camouflaged all the others, behind a vibrant wall of flowers. And inside the house that shook when anyone walked from room to room, there was Mommy’s room papered with real wallpaper, though too thin and delicate to actually touch! While in her parents’ room her mother had done the Mommy thing that was so typical of her: she had papered her own bedroom with flattened cardboard boxes and brown butcher’s paper. As she describes the way the chickens gave her back these memories, she also gives memories back to the reader – at least to this one. We had chooks in my childhood home, though I didn’t have to wring any necks and our chicken meals were a lot less frequent than the Walker family’s. This book is full of wonderful descriptions of chickens – their behaviour around roosting, their alarm at predators (river rats and hawks in my case, North American beasties in Walker’s), their joy at being fed and called to by humans’ crude impersonation of their cries. These felt like a generous gift of memory. Walker brings to her chickens with the kind of attention I remember from my childhood, and her descriptions of them capture beautifully the joy of being close up to other species. Actually this book isn’t as bad as that. It is, after all, by Alice Walker. ‘I will keep broken things‘ is one to remember, and ‘Sixty-five!’ is a great birthday poem. But I did feel that I was reading a devotional booklet for a New Age religion that I’m not a member of. This event, presided over by the genial Michael Brennan of Vagabond Press, more or less continued the launch of that publisher’s new Asia Pacific Poetry Series at Gleebooks on Saturday. A modest crowd sat around at small tables, while, to quote the Festival web site, a line-up of 10 writers made ‘poetry sing in its many voices across languages and get a little beyond the anglosphere’. Kyoko Yoshida from Japan kicked off with a surrealist short story from her collection Disorientalism. She said she’d never been to Australia before, but the story was set here, and featured a weird love triangle in which one participant was a kangaroo who was very good at sales. Violet Cho read a long poem in a Karen language, followed by David Gilbert reading us his English version. It’s fascinating to hear the music of a poem before having any idea of its meaning. And Karen is very musical. Robert Nery, a Sydneysider, read poems translated from Tagalog: crazy, dangerous street scenes filled with brand names, many immediately recognisable to a Sydney audience – capitalism makes the whole world kin, perhaps. Elizabeth Allen, one of the two pillars on which Vagabond Press stands, represented the Anglosphere – anglophone Australia is after all part of the Asia Pacific. Nhã Thuyên fro Vietnam was next. In introducing herself she said she was nervous (and perhaps she had a cold as well), that she was usually more human than she was right then. She read beautifully and musically in Vietnamese, and Liz Allen stepped up to the mike with an english version. Bella Li, from Melbourne, read in a dour, uncompromising Melburnian manner. Mabel Lee, who had been introduced by Michael Brennan as the matriarch of Chinese translation in Australia, read magisterially. ‘There must be as many women writing poetry in China as men,’ she said by way of introduction, but it’s men who get all the attention in the outside world.’ Her edition of poems by three Chinese writers, two of them women, Poems of Hong Ying, Zhai Yongming & Yang Lian, is Number 6 in the Asia Pacific Poets Series. Adam Aitken is too young and too mild-mannered to be called the patriarch of anything, but he brought a certain local gravitas with him. He read ‘Ala Moana’, which was published in his chapbook, Tonto’s Revenge, and is the only poem of the session that I’d read previously. Adam described it in his introduction as an anti-touristic touristic poem. Dinah Roma read last. Her Naming the Ruins is the first book by a Philippine poet living in the Philippines to be published in Australia. We walked out into the sunlight ‘with fragments of poems like ornaments in our hair’ (to quote a poem a student wrote for me in my brief stint as an Eng Lit tutor in a bygone era). Usually it rains and is nasty for at least some of the Writers’ Festival. Not so far at this one. David Malouf is probably the most loved public figure in Australia. His novels are justly acclaimed. His poetry too. I was surprised to learn from Tegan Bennett Daylight, his interlocutor in this session, that the recently published A First Place is the first collection of his essays: it seems as if his writing about Brisbane and his Queensland education have been working away on the general consciousness for decades. This was a wonderful session. Tegan Bennett Daylight mentioned in passing that she had been immersed in Malouf’s work for a couple of months in preparation, and it showed – not in any encyclopaedic knowledge but in a deep appreciation, and in a willingness to risk interpretations. At one stage David said that in a conversation about a book, the only person who hasn’t read it is likely to be the author. Everyone else is in a position to see things that the author can’t see. (Doesn’t that just cry out for the hashtag #oftwasthoughtbutneersowellexpressed? A lot of his talk does that.) Emboldened, TBD offered her observation that all DM’s novels are about a man who finds himself removed from his usual environment, and in the new environment, seeing things freshly, discovers what it is to be. The example she gave as her test case was from Ransom. DM didn’t respond directly to her thesis, but spoke charmingly at some length about what he was trying to do with that part of the book. A little later almost apologised, saying that what he had said didn’t in any way contradict her thesis. The conversation played out like a beautiful piece of theatrical improvisation: no one blocked, every question led somewhere interesting. A couple of times Tegan had to take a moment to process what had just been said to her, while David stayed ready to field whatever she gave him as a result. When she ventured into potentially dangerous waters and asked this eminently private author about being in love when writing one of his books, he managed with extraordinary grace to give no information about his private life while answering the question very interestingly about the book. The session finished with David reading ‘Night Poem’ from Earth Hour (I would have asked for ‘A Green Miscellany’ or ‘Touching the Earth’), and then, most beautifully, Tegan drew our attention to David’s generosity as an interviewee, in particular his generosity to her. I hope this conversation turns up on the radio. Do listen to it. This was a documentary movie by Pratibha Parmar, followed by Alice Walker, again in conversation with Caroline Baum. It went some way to explaining the awkwardness of the previous evening’s conversation: how could they talk about Alice Walker’s life and times when they knew that the next afternoon many of the people in that audience would be seeing this movie, which is nothing if not the life and times of Alice Walker? The film goes into detail about her work, her activism and how they relate to each other in a way that was frustratingly not there yesterday. Her early life, her participation in the Civil Rights movement, her relationships, the writing of her books, all were in the film, where yesterday had tiptoed around them. The film also shed light on what I registered as a kind of serene abrasiveness. Alice Walker hasn’t been in the habit of speaking in order to be liked: I knew The Color Purple had been criticised, but had no idea what a vehement and sustained attack she had endured. And there has been plenty of nastiness in the press since then, often enough from African and African communities, about her writing about uncomfortable truths as much as about her personal life. She has been on the receiving end of some of the worst of celebrity culture, so a little wary defensiveness is more than understandable. Also, my companion pointed out, she has fabulous clothes and has created a beautiful living, meditating and working environment for herself. We didn’t stay for the talk, because we had to eat, catch up and walk up town for our next session. Having just been to a movie, which arguably belonged in the Film Festival rather than the Writers’ Festival, we now went to a stand-up show, which you might think belonged in the Comedy Festival. We knew Sandi Toksvig as one of the occasional women panellists on QI. This show, she said, was her Valentine to Life. It began and ended with bits of Beethoven’s Ninth Symphony; we learned a little Danish which led to a surprisingly poignant pay-off; we found out that Sandy Toksvig has been on British Television for 34 years, and some of the audience vocally remembered her from a children’s show – ‘I see that some of my children have gown up,’ she said). We laughed a lot, and bought one of her books, which turns out to be a female to male cross-dresser who enlisted to fight in the Boer War. 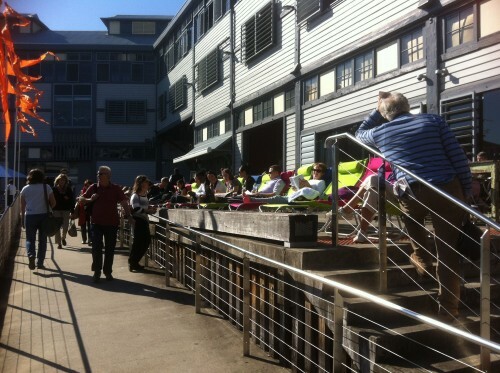 By one count, the Sydney Writers’ Festival has been going since the weekend. The opening address, by all accounts brilliant, was on Tuesday night. My festival started yesterday. My first event – a poetry reading in the English Department’s Common Room at the University of Sydney – wasn’t strictly part of the Festival, but two of the poets were in Sydney for the Festival, so I’m counting it. I had to leave early to catch a bus to the Opera House so I only got to hear one and a half poets, all of Fiona Hile and half of Kate Lilley. Sadly, I missed out on Louis Armand from Prague, and Pam Brown. The room was full of poets. Overheard pre-reading conversations (there were nibbles and drinks) included happy reports of ‘having something accepted ‘ in a coming anthology. John Tranter recorded proceedings for the Penn Sound Archive. Vagabond Press was selling in a back corner. That wolf you’re wearing goes with everything. In introducing Kate Lilley, Fiona Hile conjured up a fabulous image. She said she used to think it was uncool to have heroes, but when she began writing her own poetry, she had four horsewomen: Kate Lilley, Pam Brown, Gig Ryan and Jennifer Maiden. I’d love to see the movie that has those four poets charging into battle. 7.30 pm: The Life and Times of Alice Walker, in which Alice Walker was interviewed by Caroline Baum and joined by Archie Roach. The SWF blog already has a report. As is customary at the Sydney Writers’ Festival, the session bore little relation to its title. Alice Walker was in no mood to tell her life story, or to discuss her ‘times’ with any specificity. The tone was set right at the start when Caroline Baum asked, ‘Are you nervous at the start of events like this?’ and Alice Walker replied, ‘No,’ and waited serenely for the next question. CB bounced back by asking her to read us a poem, and she obliged with ‘You Should Grow Old Like the Carters’, which she read beautifully, giving each word its full weight, conveying the music , treating herself and the poem as worthy of our full, serious attention. That mix of awkwardness, resilience on Caroline Baum’s part, and weight on Alice Walker’s kept up for the whole session. CB: So you grew up in a house without books and were part of an oral, story-telling culture. CB: You read a lot when you were young. I believe your favourite books were … and Jane Eyre. What was it like the first time you read a book with black characters you could identify with? Fortunately, Caroline Baum has a wonderful capacity for putting herself out there, and then bouncing back when she has her knuckles ever so serenely rapped. Another reason the session seemed such hard work is possibly a problem of definition. Is Alice Walker at the festival as a writer, an activist, or a vague kind of celebrity? Well, obviously, she’s a writer. But The Color Purple was published roughly 30 years ago, and I wonder how many people in that huge hall had read Possessing the Secret of Joy, or made it all the way through The Temple of My Familiar. As a poet she would draw a crowd, but not this big a one. Many of her essays are absolutely brilliant: ‘In Search of Our Mothers’ Gardens’, ‘Only Justice Can Remove a Curse’, her essays on Zora Neale Hurston and Bessie Smith, on olive oil, the scar in her eye … I can rattle those off without googling. And a new collection of essays – Cushion in the Road: Meditation and Wandering as the Whole World Awakens to Being in Harm’s Way – has just been published. But how many essayists can fill the Opera House? As an activist, she has an impressive record. She campaigned very visibly against female circumcision a while back, and was part of the flotilla that was intercepted so dramatically on its way to Gaza. But as far as I know she’s not part of any activist organisation and her activist philosophy boils down to stressing the importance of having friends (a ‘circle’) you can be completely honest with, and meditation seems to fit there. Celebrity seems to be the key. So although the conversation touched on many things, and Caroline Baum kept pulling the conversation back to the recently published book, my overwhelming impression was that we were in the presence of celebrity, who was dispensing her wisdom for our benefit. The most telling celebrity moment was when she was asked about her daughter’s very public statements that her activism had made her a neglectful mother. Her reply included no whiff of self doubt, no hint that her daughter might have had a legitimate point (as the children of many activists surely would). The problem was that her daughter suffered from ‘mental instability’, from which she had now mercifully recovered. This dismissiveness was cloaked in serious and valid reflections on the legacy of slavery on her family, but it was dismissive all the same. We were to make no mistake who was the important person in this conversation. I’m sorry if that’s jaundiced. I’m still a fan. I will buy the new book of essays, and probably her new book of poetry as well. I’m seeing another session with her on my second day, and hoping I’ll have a change of perspective.